Wauwatosa City Hall is located at 7725 West North Avenue, Wauwatosa, WI 53213; phone: 414-479-8900. Photo: J.H. Fiebing House, ca. 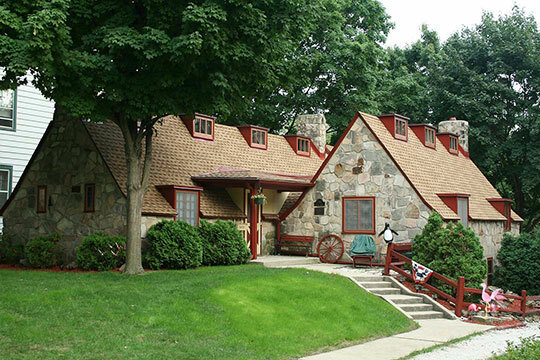 1925, 7707 Stickney Avenue, Wauwatosa, WI. Listed on the National Register of Historic Places in 1985. Photographed by User:Freekee (own work), 2009, [cc-by-3.0 (creativecommons.org/licenses/by/3.0)], via Wikimedia Commons, accessed June, 2016. The Village of Wauwatosa was founded in 1835 as Hart's Mills. The original settlement area was located at the point at which the present Harwood Avenue crosses the Menomonee River, approximately three blocks south of the District. Harwood Avenue was originally built as the United States Road in 1838. This was a military road built by the federal government as a communications and supply route from Milwaukee to the western parts of the State. The original settlement which grew up around Charles Hart's saw and grist mills accounted for the earliest streets in the Village. The United States Road (Harwood Avenue) became the main commercial area at the river crossing with residences spreading to the east and west. Wauwatosa Avenue was developed running north from Harwood and was populated by farms. In 1853, as the early institutions in the village were developing, Church Street was constructed as the first local street in the community. Named after the Congregational Church, which was built on the site its successor still occupies, Church Street was the first street to be developed as a local street rather than as a highway. The settlement of Hart's Mills was renamed Wauwatosa on April 5, 1842 when Wauwatosa Township was separated from Milwaukee Township. Although the Village of Wauwatosa was not formally incorporated until 1892, the settlement at the river crossing was known as Wauwatosa from that time on. Wauwatosa started as a small farming community clustered around the mills built by Charles Hart. In 1849, the Watertown Plank Road, a privately held toll highway, was constructed along the route of the present day State Street. In 1850, the Milwaukee and Mississippi Railroad reached the Village. The conjunction of two major highways and a railroad at this point caused the small commercial area to expand and settlement to increase. Wauwatosa remained a small farming Village until the late 1870's when frequent rail traffic, the improvement of local roads, and the growth of the City of Milwaukee as a commercial and industrial center, saw the arrival of the first families which would later cause Wauwatosa to become a commuter suburb of the larger central city.